Current: Who are your favourite current players? All-Time: Who are your favourite all-time players? Music: What music do you like to listen to? Film: What films and film stars do you like? TV: What do you watch on TV? Books: What books do you like to read? General: What other interests do you have? This competition is no longer available. It may be last season's competition. Please check your association's website. ACC Quarter Finals 23rd August Games ON!!!! 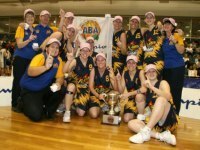 Great to have one place where all the ABA ladders & results are. Great idea. Well done!